7 year/s ago 1096 Visit WebsitePolskiBroken link? Our Company has been functioned on homeland and foreign markets since 1989. 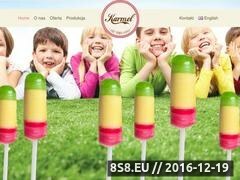 We offer nearly 20 kinds of products, mainly different tastes and shapes lollipops, drops, hard caramels and Christmas tree icicles. We warmly invite you to acquaint with our offer. Our products have excellent quality and delicious taste and are free of preservatives. Sorry, BrowseInter.net Website Directory does not contain yet any other websites related to lollipops, caramels or producer!